This is the last seventh pranayama. After practicing all six pranayama concentrate your mind on inhaling and exhaling for some time this is called Pranav pranayama. This is very simple breathing exercise. This is one type of meditation pranayama. Procedure : Close your eyes and sit quitely. Breathe in naturally. Concentrate the mind on inhaling and exhaling and think of god. God has created our eyebrows, eyes, nose, ears, lips, heart etc. in Aum shape (Hindi word). Imagine the presence of god in every particle and meditate. Benefits : Deeper the experience, deeper the physical, mental and spiritual energy. It gives physical and spiritual energy. Gives relief from mental stress and overcomes the physical disorders. Gives good health, strengthen the mind. Help in meditation. Increases concentration. Helps in spiritual development and widen our perspective. After doing all the Pranayamas, concentrate your mind on inhalation and exhalation, and meditate upon udgitha(OM) with your prana. God has made poles in the shape of ‘omkara’. This pinda (body) and this bramanda (universe) both are in the form of‘omkara’. ‘omkara’ is not a particular person or figure; it is a divine power which is controlling and regulating the whole universe. Turn yourself into a spectator (=Soul) and while inhaling deeply and exhaling subtly your respiration rate should be so subtle that you do not feel like hearing the sound of your breath, and even if one puts a cotton swab before your nose it should not shake or quiver. Gradually increase the practice and try to breathe in and breathe out once in one minute. Thus, try to look at the breath inside. In the beginning the friction of breath will be felt on the tip of nose. Gradually you shall be able to feel the touch of breath deep inside you. Thus, by chanting ‘omkara’ with every breath as a spectator (=Soul), one starts going into meditation automatically. Your mind will become highly one-pointed, absorbed in and identified with ‘omkara’. Along with 'Pranav' the great Gayatri mantra from the Vedas should be chanted and recited, imbibing its meaning. Thus, through meditation a seeker can become identified with Brahman, the very essence of Existence, Consciousness and Bliss, and can attain the unique divine ecstasy of samadhi. Even while going to bed one should meditate into sleep, By doing this his sleep will be blessed with yoga; he will get rid of nightmares and will have a quick and sound sleep. Duration of Pranav Pranayama When as a spectator (=Soul) we concentrate our mind on the rhythmic flow of breaths, the prana gets subtle automatically, and we inhale once in 10-20 seconds and exhale in 10-20 seconds. Through long practice a yogi takes one breath in one minute. 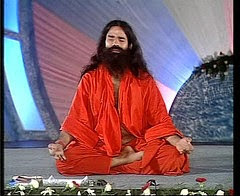 After bhastrika, kapalabhati, bahya Pranayama, anuloma-viloma, bharamari and udgitha, this Pranav Pranayama is done, which is another form of vipasyana or preksa dhyana. It is completely meditation based. Everybody must do this meditation-based Pranayama. Yogis practising samadhi do this penance of breathing accompanied with meditation of Pranav for hours together, according to the availability of time. There is no sound of breathing in this procedure, i.e., this soundless penance takes a seeker into the deep silence within, where his senses merge in the mind, the mind in the prana and the prana in the Soul, and through Soul a seeker realizes the universal Soul, supreme Soul and Brahman. It is the path which has Pranayama as its starting point from where it gradually and spontaneously leads from the constant practice of Pranayama to pratyahara (withdrawal), from the constant practice of pratyahara to dharana (concentration), from the firm and constant practice of dharana to dhyana (meditation), and from the constant practice of dhyana to samadhi (absorption). With this prana-sadhana (pranayama), there is a union of dharana, dhyana and samadhi, and samyama is attained (trayamekatra samyama¨). From samyama a sadhaka attains praj.aloka, which gives him selfhealing, which ultimately blesses him with the experience of selfrealization. He is encompassed by a dazzling aura which works as an impenetrable armour to protect the sadhaka (seeker) from all diseases, disorders and polluting influences. Spiritual development and to widen your perspective so that you begin to realise the One In All and the All In One - the constant universal vibration AUM/OM, which is found in every single minutest atom.